ASKIN’s “All in one” ceiling and insulated roof panel system is fast to install, weather tight and extremely thermally efficient. The ASKIN Roofing System is a fully insulated Ceiling & Roof “all-in-one”. It is fast to install, weather tight and extremely thermally efficient. The system’s design means a reduction in installation costs, incorporates a prefinished internal ceiling and superior spanning capability. It can be utilised in place of traditional “built-up” layered roofs and can far exceed the BCA Section J (Thermal Requirements). With Key supply partners, ASKIN offer a range of skylights, trafficable access walkways and safety systems to complement our roofing systems. 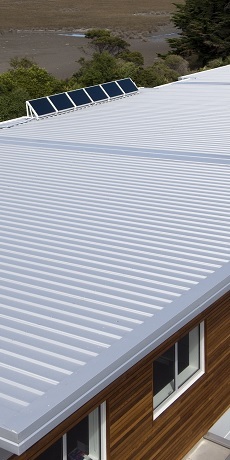 Unideck Roofing Panel Profile is available in a standard width of 1200mm modules. ASKIN Metric Roofing Panel is available in a standard width of 1000mm module. Variable panel widths between 600mm – 1200mm available upon request, subject to minimum order quantity (MOQ). All panels are manufactured to length +/-5mm, as determined by handling, design and transportation up to a max of 25 meters.